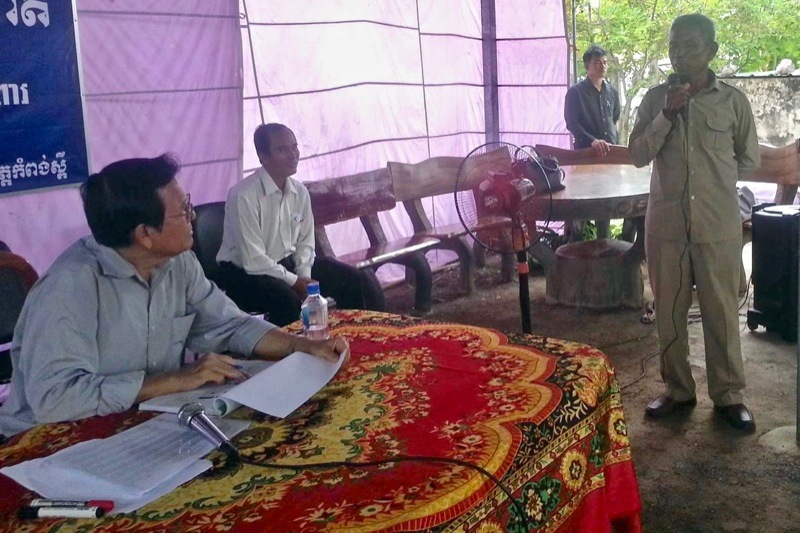 CNRP President Kem Sokha, left, listens to a supporter speak at a meeting in Kompong Speu province on Sunday, in a photograph posted to Mr Sokha’s Facebook page. The tour of 24 provinces and Phnom Penh, which began early last month and will continue for another two weeks, has taken Mr. Sokha to divergent districts—some where the party fared especially well in the commune elections and others where it did poorly, according to party spokesman Yim Sovann. Mr. Sokha, who built his reputation as a grassroots organizer, wrote on his Facebook page on Sunday that the visits were the first element in building a successful party strategy after the party captured 44 percent of the popular vote at the June polls, falling well short of its goal of 60 percent. Local officials have been instructed to gather “comprehensive and very precise” information from their villages and communes by identifying supporters and hearing out their concerns, according to Prince Sisowath Thomico, a member of the party’s steering committee. The CPP has spent decades building a party network stretching down to the village level, leading some analysts to cast the CNRP’s pickup of about 30 percent of the country’s communes as an upset. The CNRP, formed from two smaller parties in 2012, now is focused on applying the lessons of communes where it did well to those where it fell short, Mr. Sovann said. 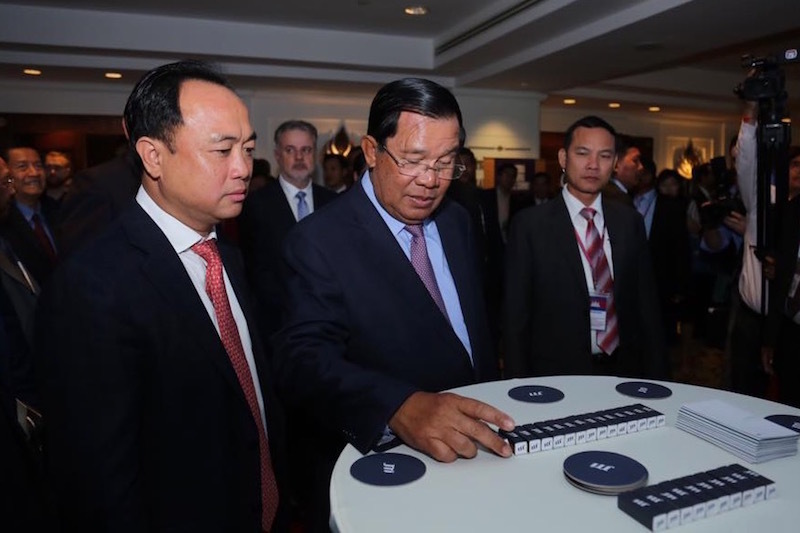 Mr. Sokha was interested in gathering information on the popularity of both elected and party leaders, according to Mr. Sovann, who declined to provide details on the methods of data collection. “We will allocate our energy and time and resources to the places where we get less support,” he said. The CNRP’s deputy public affairs director, Kem Monovithya, wrote in an email in June that party officials would also collect figures on microfinance debt—“How many families are in debt, how much they owe, and what’s their repayment situation”—in order to connect them with services. She did not respond to requests for comment on Tuesday. Chum Sorphoan, head of the CNRP’s executive committee in Kompong Speu province’s Chbar Mon City, said Mr. Sokha had used a meeting there on Sunday to urge officials to keep close tabs on party member’s concerns through meetings and surveys. “He advised our activists to strengthen local-level structures and go to meet with local-level supporters at their houses” to hear their concerns, Ms. Sorphoan said. Party activists told Mr. Sokha that violent rhetoric by senior CPP members made them afraid. “They said that [the CPP] has financial resources and power and now has threatened to use the bottom of bamboo sticks to beat us,” Ms. Sorphoan said, referencing Social Affairs Minister Vong Sauth’s threat last week to pummel election protesters. “Some of them are really scared that if we join a protest, we may have our teeth smashed,” she added, citing a pre-election threat by Defense Minister Tea Banh. The government has downplayed both statements as mere warnings to would-be revolutionaries. Stymied by arrests, threats, and legislative maneuvers, the CNRP will have a difficult time chipping away at what appeared to be a steadfast core of CPP loyalists, political analyst Meas Nee said on Tuesday. The CNRP’s relatively small pickup in supporters from 2013 to the June vote—and the CPP’s relative consistency between the polls—suggested the limits of the opposition’s growth, according to Mr. Nee.